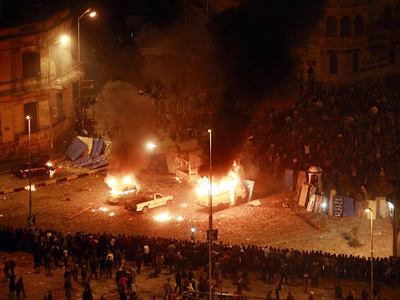 By 4am, Al Tahrir Square and the adjacent streets are fully in the hands of the rebellion. 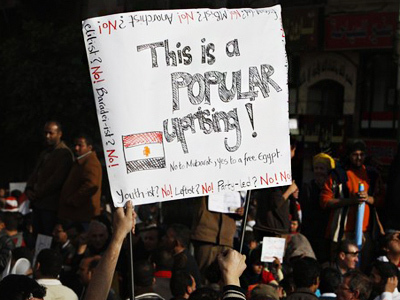 At the same time, the people are alarmed, although the people are many and nobody goes away – young people are dancing or marching on the square. Food, tea are prepared, litter disposed. Some are sleeping right on the asphalt or barren ground. Mubarak’s supporters vanished back into the evening. Nobody is losing vigilance, though: everyone who comes onto the square is checked for his or her ID documents and frisked. 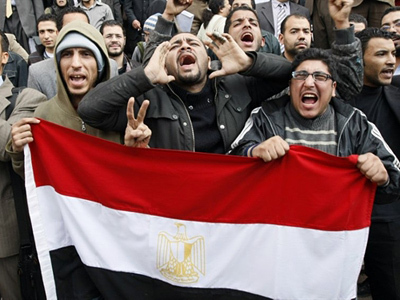 My press card always evokes enthusiasm: “Oh, Russia!” – both among the rebels and Mubarak’s supporters. I feel somewhat awkward before my colleagues. The latest reports about the rebellion in Egypt from world TV channels were about the very bad treatment by the army and security forces of journalists. My Greek colleague, whenever he is alone, is taken for an American and gets arrested all the time by security agents. Today he was arrested again, his photographs were rummaged and he was forced to erase not only the shots made from the square but also from Athens, where some people were photographed beating an official. During the night, many approach me on the square having seen my camera and tell me about their concerns. This odd hush is frightening. As if by magic, not only the most aggressive supporters of the regime disappeared but also the reporters, although nothing is yet over and the crisis is not resolved. 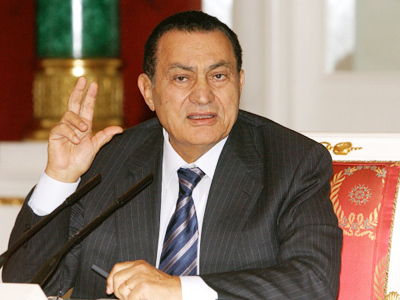 On the contrary, it has entered its decisive phase right after the harsh words of Obama and the leaders of five European countries that Mubarak should immediately start power transition procedures. At the same time, world TV channels are not showing the square anymore, not only live but even avoiding mentioning it. People say that the picture disappeared from the screens too abruptly, which can mean not a victory over the regime at all, but will only increase the feeling of its impunity. It’s also amazing how diligently the world media avoided the anti-Israeli rhetoric and the symbols of the rebellion, whereas Mubarak caused hatred not as much by being a US ally as by having recognized Israel and taken part in blockading Gaza. The fact that during the first days of the rebellion the Egyptian border guards fled and the Gaza blockade fell was passed over in complete silence by the mainstream media. Professor Amr came specially from Alexandria. He rented an apartment for his wife and asked her to monitor the media coverage of the events and report to him, in order to have everything analyzed on the Square. As for himself, he spends the nights here. Much has changed on the Square. For instance, medics have appeared. A mobile hospital and a pharmacy have been set up. During the nights, not only bulky strong men but also young female nurses are on duty. By daytime the rebellion acquired some sense as the rebels seemed to have decided to retain the Square and to organize themselves. In the past days, only people of faith and those sympathizing with the Muslim Brotherhood gave the impression of being well-organized and responsible. They not only started their prayers right on time, but also quickly organized delivery of food and water, disposal of rubbish, prevented clashes with provocateurs and the harsh treatment of those who were caught. Even the checking of ID documents and pockets was well-organized by the well-disciplined people of faith but not by dreamy liberals, of whom there are too many here. And shouting slogans, composing revolutionary raps, performing victory dances, rattling with metal rods and whistling can be easily done without ideological instructions. Only the Muslim Brotherhood has a sort of headquarters on the Square, despite the fact that their organization is banned – all the members and their families are under constant surveillance. Every one of them is facing a real risk of being in public, where informers and provocateurs are many. It was only them who put up a screen to inform other citizens about what the media is saying about the protests. Provocateurs and secret agents are dealt with as follows: they are captured during their attempt to penetrate through the human chains. Sometimes weapons are found on them, sometimes they behave improperly and start squabbles. Sometimes an agent may be beaten, however the disciplined citizens immediately recapture the individual and lead him away to have things sorted out, after which he is turned away from the Square. My colleagues filmed Mubarak’s supporters’ treatment of an opposition representative who was severely beaten by the crowd, and nobody tried to defend him. ­For more pictures see RT's gallery. Women from the Muslim Brotherhood would approach me and warn me to be extremely cautious, because I am being monitored, filmed and followed. “The authorities want no journalists to be here, which would let the authorities be free to deal with all the rebels without witnesses. You are an eyewitness and you’re in danger. Now it’s the most dangerous time – the hush,” they warned. The girl passes a hairpin to me so I can appear less noticeable. Later, a member of the Muslim Brotherhood found me on the other end of the Square and asked me to inform all the journalists that a French reporter’s passport had been found and was kept in their headquarters. It’s amazing that the correspondents I asked to help were at first frightened and only afterward agreed to help. During the daytime, food, water and blankets were brought in in good amounts. An old lady with grey curly hair saw a particularly slim soldier on a tank and solemnly handed a blanket to him. He pressed the blanket to his chest for some time, until his mate took it away from him, laughing. 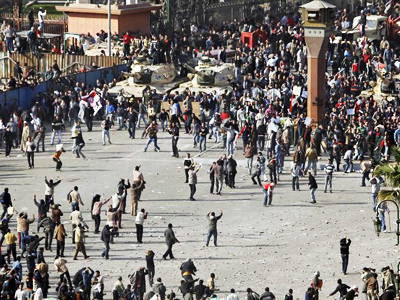 Earlier, the tanks had been deployed and directed toward the Square. They were captured by the rebels. The officers vanished, and up to a dozen citizens climbed on top of it, watching the stone-throwing battle but not making a single attempt to start the tank. 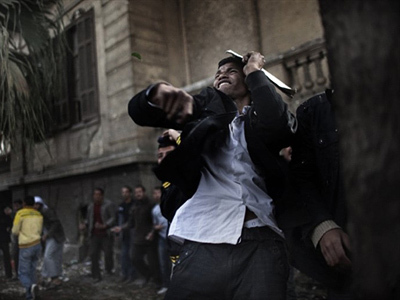 The barrels were already directed on Mubarak’s supporters, though. When I left the Square late last night, the rebels were already in control of Qasr al-Nil Bridge. Whereas the previous night it had held supporters of the regime, now the bridge over the Nile was absolutely empty. For those who recall the lessons of the Russian Revolution, control over the bridges is not mere empty words but much more significant than retaining the square near the Egyptian Museum.